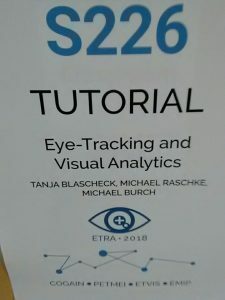 On the first day, together with my former colleagues from the Institute for Visualization and Interactive Systems Tanja and Michael, I gave a tutorial on visual analytics for eye tracking analysis. It was my fourth tutorial on this topic after our debut at KogWis in 2014, Eurographics 2015, and ETRA 2016. 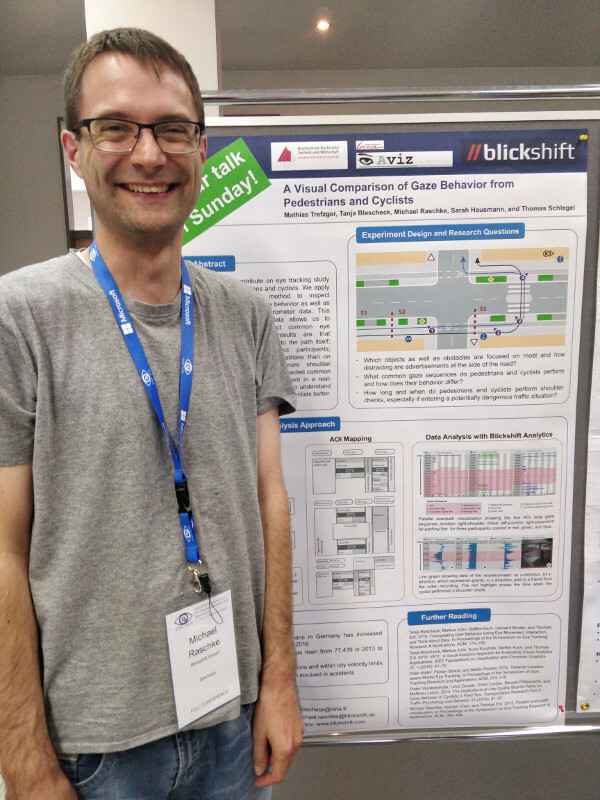 My part was to give an introduction into Blickshift Analytics, the first visual analytics tool for a broad user group. I was very excited to show the main features of Blickshift Analytics and was very happy to see the very positive feedback of our participants. In the late afternoon, we have closed the tutorial with a Q&A session on the future of eye tracking analysis and its challenges. During the next three days, I have attended mostly the main conference track. On the first day, the keynote by Susanna Martinez-Conde gave an interesting overview about research questions in the field of saccades and micro saccades analysis. Susanna explained why visual elements in the environment are faded-out due to micro saccades and she presented how painters are using this effect to guide the visual perception in paintings. In the next sessions, papers have been presented about cognitive aspects and fundamental sensor research. In the late afternoon, I have shown our demo about a scan path comparison of pedestrian and cyclists. In our work, we show how eye movements of pedestrians and cyclists can be compared with each another efficiently using a visual analytics approach. Finally, in the evening there was the ETRA dinner in a very exclusive club in the center of Warsaw. We all celebrated the tenth ETRA conference! And, we all agreed on that the future of eye tracking will be very exciting! On Saturday morning, Andreas Bulling gave a very inspiring keynote about the future challenges of pervasive eye tracking showing a bunch of solutions and applications of ubiquitous eye tracking from his research group. 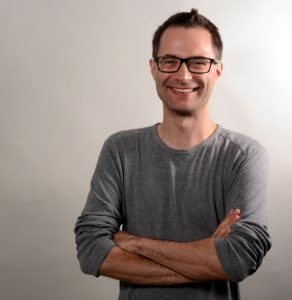 Beginning with first of August 2018, he will become full professor at Stuttgart and will lead the HCI group at the Institute for Visualization and Interactive Systems. I am very happy that he will join our former institute and looking forward to this new eye tracking research center in Stuttgart! After the keynote, I joined the Pupil Labs workshop to learn more about their eye movement recording solutions. Especially their demo how fingers can be used for eye tracking calibration was very impressive. In the afternoon, I continued my workshop day attending the Occulus workshop. Javier San Agustin, former co-founder of Eyetribe, and now head of eye tracking research at Occulus, gave an overview about how eye tracking might be used in the new generation of Occulus VR glasses. A very important question for Occulus is to develop a very exact calibration to avoid motion sickness. 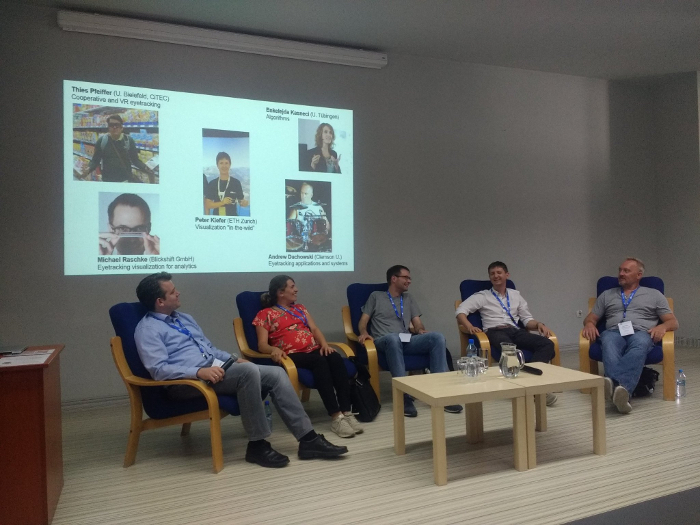 The day closed by joining the panel discussion at the ETVIS panel about the question “How can visualization make a larger contribution to ETRA?” together with Enkelejda Kasneci, Peter Kiefer, Thies Pfeiffer, and Andrew Duchowski. The last day of ETRA started with a keynote about eye tracking in education by Halszka Jarodzka. In the first half of her keynote she motivated to think about privacy issues of eye tracking data and stated that these questions will become very important within the next years. In her second half, she talked about how eye tracking is used in learning environments.